If you are using Kodi, then definitely you would have used some kodi addons for watching movies, tv shows, sports, etc. Whenever you open some movies or tv shows from addons like exodus, it will load the list of servers available for streaming the videos. Have you ever noticed openload in the list of servers? I am sure you will! When you choose openload server for streaming, it will prompt a openload popup box requesting for openload pairing. 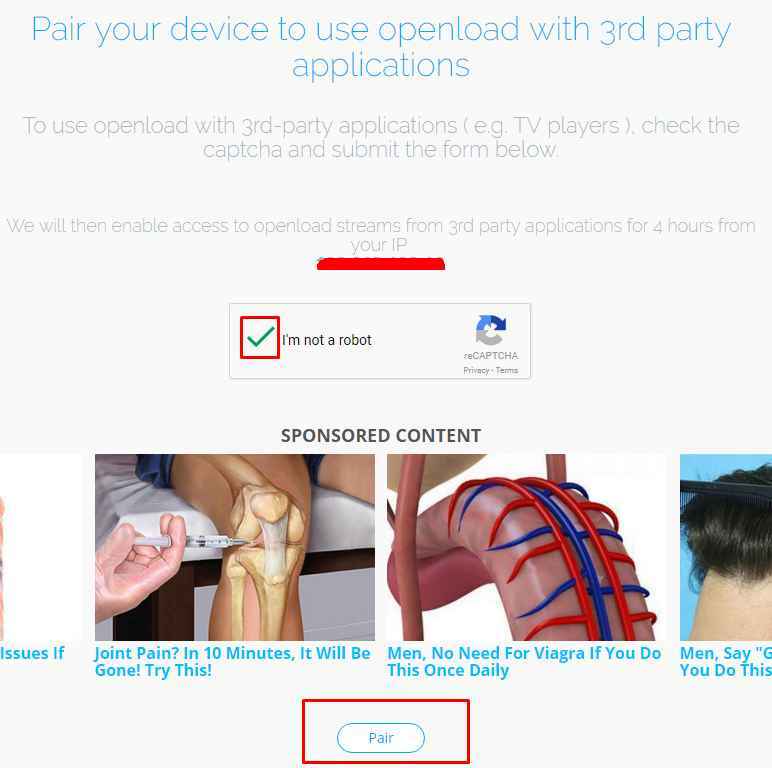 It’s nothing but the stream authorization provided by https://openload.co/pair. 1 What is openload.co pair kodi error? 1.1 So, what is the necessary for openload pairing? 1.2 Is openload pair safe? 2 How to fix openload.co pair kodi error? What is openload.co pair kodi error? So, what is the necessary for openload pairing? In order to know this, you can assume openload.co as a server for hosting the movies. As there is a heavy demand for watching movies and tv shows, if many open the server at the same time then it would crash. So in order to get rid of that, the concept of stream authorization is introduced. So you would need to pair your network (i.e IP) by using openload.co/pair (Now it’s called olpair.com). Once you have paired your network, you can enjoy the free streaming of movies for 4 hours. Once the time gets over you need to pair it again. If you ask me the same question, then I would NOT say it’s 100% safe. Because streaming latest movies, tv shows, PPV videos and other things are illegal because of the copyright problems. So if you stream them on your IP, then obviously you are leaving a footprint. So if you want to be 100% safe and anonymous while watching movies on kodi, then we highly recommend you to have a VPN. With a VPN service like IPVanish. you can mask your IP address completely and stream anonymously from a different location in the world. I guess it’s enough explaining about openload.co pair. Let’s now check the steps to fix this problem! How to fix openload.co pair kodi error? 1.Make sure you have connected your streaming device and your mobile / pc on the same network. Hint: You can bookmark this page to copy the olpair url whenever required. 3. Now you will find something like the one in below image. 4. Here you have to click on “I’m not a robot” to verify you are a human. Once done, just click on pair option to complete stream authentication. 5. That’s it, guys! Once it gets paired you will get a success message as you see below. You can now enjoy openload with any 3rd party applications without any issues. I guess the overall time to setup openload.co pair kodi is hardly 2 minutes. Okay, let me not waste your time. Just go and enjoy your movie. This method is suggested only if the above one didn’t work out. Here we will be deactivating the hosters which require captchas verification. In addons like exodus, under addon settings you can find an option to turn of the hosters that needs such authentication. Once you have disabled, when you try to watch some movies, it would not load up those servers. The problem is, you may end up with no servers ready to stream the movie. So if you are not servers available then revert back these settings and again try the first method. If you are facing any issues, let us know in comments. No, you need not subscribe or provide any credit card info.Just activate streaming with your IP. It’s done. Actually, the olpair site opens another window that has nothing to do with pairing. I have to fight to go back to the olpair site. Sometimes the page that opens corrupts my device and I have to clear all data. Olpair rarely works anymore. Continues to tell me bad gateway . Yes it’ll take you to an unrelated window saying you need to subscribe. This is just an ad for something totally different. Just exit out of that window back to the openload pair page you were on and it should now say you’ve been paired. I paired openload and on the site it says paired but it still won’t work. The openload.co pair times out on Kodi. It just started a few days ago it was working perfectly before then. Even though it is paired it still won’t play on Kodi what’s the problem? Can anyone tell me why the IP address is different on the olpair site to the IP address my kodi box? Im not running a vpn. Why is it that I’m not getting any volume to a movie? Great movies and than you.